It’s not too late, you know. I could develop a sudden stomach ache, or 48 hour bug. What lies ahead is only going to be the coldest experience of my life: 24 hours camping outdoors in Minnesota with my son’s Boy Scout troop. The fleeting thought escapes before it gains traction. I finish loading our bags in the car. We arrive at the church in downtown Broken Arrow, where we will depart. Stephanie insisted on dropping off Miles and I, so she could drive my car while we were gone. Stephanie took a few pictures, but she bailed before we hopped on our tour bus. It was 20 degrees, and way too cold for her. We actually leave 5 minutes early! This trip is already looking promising. I am impressed with the precision of this troop. The bus is flagged down by a vehicle with two scouts inside. The bus pulls over one block from the church to allow them to board. Everybody takes this in stride, and generates a few chuckles from the adults. Everybody is looking forward to kicking back and watching some movies on bus’s tv screens. The bus pulls over onto the shoulder, so the bus driver can get up and assist the adults with setting up the DVD and television screens. Ahhh, we’re in business now. Now Showing: Despicable Me. The bus is cruising down Interstate 44 near Vinita, as we pass under the McDonald’s that straddles the highway. The bus driver announces that this is the world’s largest McDonald’s “by square footage”. We cross the state line, into Missouri. The bus is very quiet. Most everyone appears to be watching the movie. Several people are taking naps. I notice that Miles is working on some math homework. I am impressed that he is doing this on his own initiative. He is visiting with the scout next to him and I catch a few words here and there. They appear to be talking about primary numbers. We stop for lunch in Liberty, Missouri, a suburb of Kansas City. 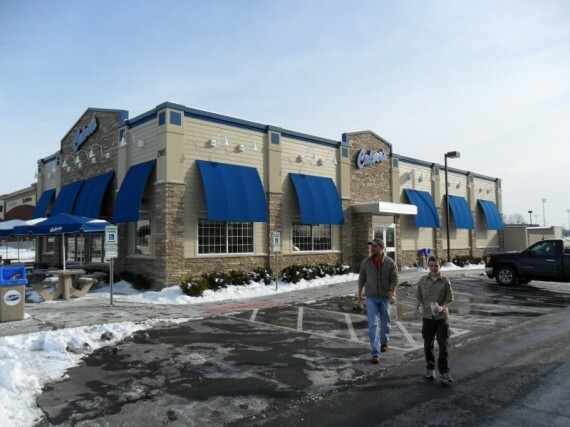 We dine at a restaurant called Culver’s. Burgers & such cooked to order. Ice cream & shakes. And Customer Service to knock your socks off! I loved this place. The managers and employees were constantly walking through the dining area asking how everything was. As I was getting some Pepsi in my cup for the road, I grabbed a lid for my drink. They had the most unusual and high-tech lid dispenser I have ever seen. I told the manager how much I liked it and she told me they get a lot of comments about it. Why didn’t I take a picture? The bus pulls out of the parking lot. Less than 1 hour to feed 44 people and get back on the road. There is no snow on the ground in Tulsa, but in Kansas City, there is plenty. The parking lot has piles of snow where the snowplows have cleared the asphalt. The bus cruises through Des Moines, Iowa, at rush hour. I am currently reading a book about the Zappos! CEO, Tony Hsieh, and Des Moines was one of a handful of cities he considered to move his headquarters to. Tony ultimately chose Las Vegas for the headquarters. Do you think Tony visited Des Moines in January? We drive past shopping centers on the Interstate and the piles of snow have gotten substantially larger than in Kansas City. We pull into Albert Lea, Minnesota. The bus parks in the KFC parking lot, and everyone gets their choice of 3 places to eat. Miles insists on KFC, as he is very interested in the Double Down. I relent and let him try it. He lived to tell about it. Everyone loads back on the bus, and we drive a few blocks to our hotel. To my pleasant surprise, the adults are placed 2 to a room! 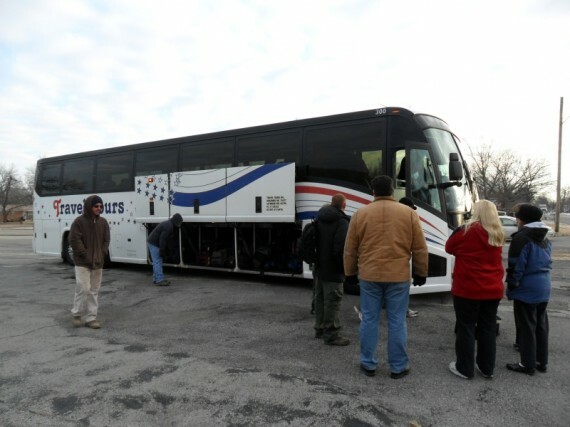 There are about 12 adults on the trip. The scouts? Their prognosis is not so heavenly. 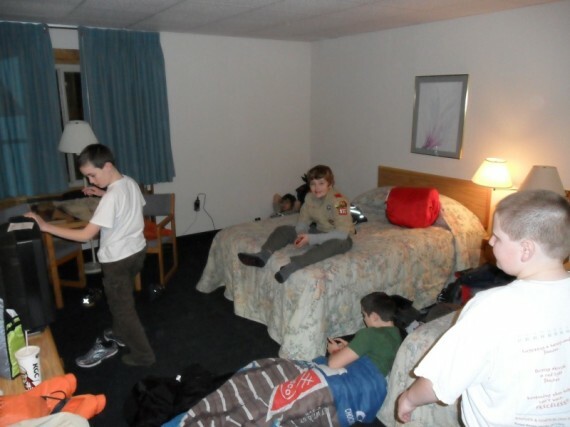 The scouts are sleeping 7 to a room. Hey, that’s why they were all advised to bring their sleeping bag. Arrive in my room with Mike, my roommate for the night. The room is ICE COLD. My first action is to locate the heater and get it cranking. Fortunately, the heater works fine and we are able to sit around in our shorts & t-shirts later. 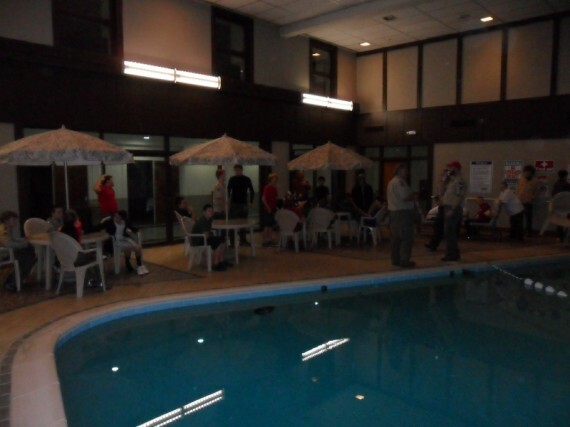 Troop meeting at the indoor swimming pool. 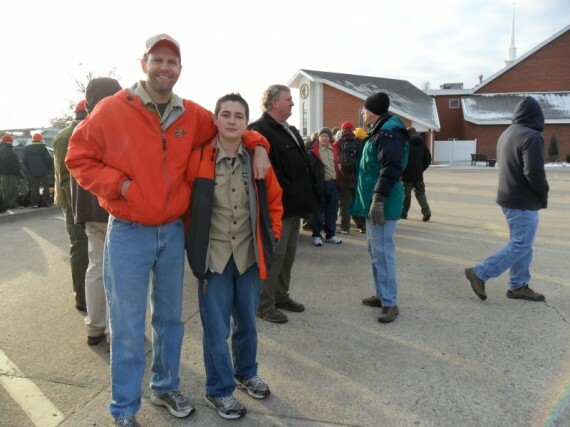 Our troop leader for this trip, Brian, lays down some rules for the scouts. I am pleased with how smooth the first day has gone. We have accomplished a lot today: we are now 600 miles from home and we haven’t lost a scout yet. I find out from a few of the scouts that there is a chance we can spend two nights camping outdoors if we get to the campsite early enough tomorrow. This is unsettling news. I have been mentally preparing to spend one night in the cold – NOT two nights. Is it too late to catch that 48 hour bug?